Palmetto Expeditions offers a variety of wildlife and nature hiking tours. See our listings below. What kind of creatures live just off the shore in the sea grass beds, the sand flats, the limestone outcrops? Evidence of the life that exists can be easily found as we walk unhurried along an unspoiled beach. 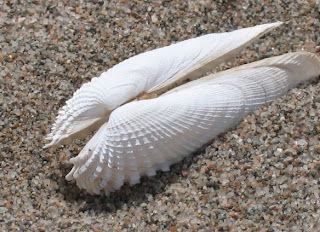 Maybe we will see colorful giant heart cockle shells, red & yellow sea whips or an elegant angel wing clam shell as we stroll along the sand. Further down the beach we may pause to admire a piece of interesting driftwood and imagine from where it came. Along the water’s edge perhaps we will spy egg cases from whelks or skates, a sea sponge, a sea urchin, algae, a conch shell, or the empty molts of horseshoe crabs or shrimp discarded as they grow. Even the strange indistinguishable “blob on the beach” is something with a story to tell! The twice monthly extreme low tides that expose the sand and mud flats will be full of signs and trails of the critters that live just a few inches below the surface. 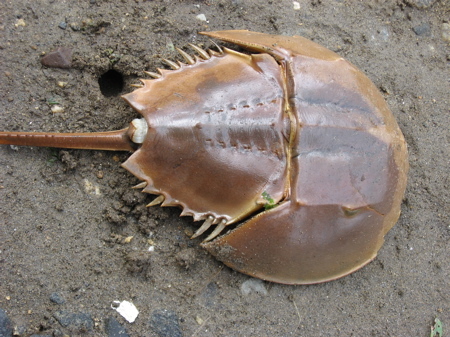 Follow a winding trail to discover a tiny horseshoe crab burrowing into the sand looking for a meal of micro-algae. Another trail will lead to the moon snail or a sand dollar. The sea stars are often stranded by the absence of water as well as several species of hermit crabs and snails. Of course, shore birds are always present, poking their bills into the sand looking for worms and small crustaceans. They are the “original beachcomber”! Away from the water at the higher reaches of the upper beach, you will find the specialists - species of flowers, trees and plants that can withstand the extremes of sun, wind, salt & storms. This is where the “wrack line” lays, a collection of bits & pieces of everything that came in with the tide. If there are small holes in the sand, look closely to see a ghost crab hiding at the entrance to its burrow waiting for the nightfall to venture down to water’s edge. The night before, a sea turtle may have nested at the highest point from the water and the “turtle krawl” tracks may still be visible, as well as the tracks of mammals such as raccoons, deer, wild pigs, and maybe even the elusive Florida black bear. 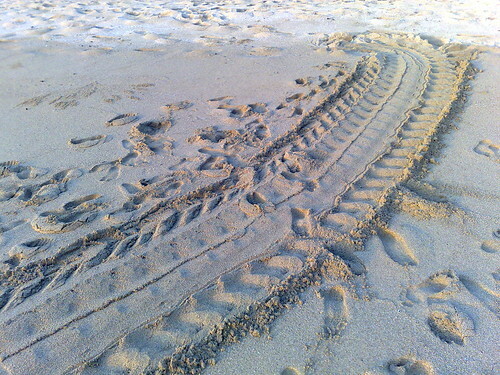 The list of what you might discover on a beach is endless. All it takes is the desire to explore and to ‘get a little sand between your toes’! I invite you to come experience “unadorned” old Florida, and discover the simple beauty of nature off the beaten track along our unspoiled coast. A Note About Debbi Clifford: Debbi has been exploring the beaches of Wakulla & Franklin counties for the past 20+ years as a marine life collector for Gulf Specimen Marine Lab in Panacea, FL. She is a certified Green Guide and a member of the Florida Green Guide Association. Debbi's experience and wealth of knowledge makes her the ideal guide to lead nature beach walks and introduce you to the wildlife, plants and scenery of our North Florida coast. See Debbi's tour immediately below with additional tour listings following. Experience Tate's Hell! Cetified Green Guide, Master Naturalist Lesley Cox will guide you on your most memorable encounter with nature through North Florida’s incredibly unique habitats on this half-day adventure!